Bruyns, P.V. Klak, C. and Hanáček, P. 2017. A revised, phylogenetically-based concept of Ceropegia (Apocynaceae). 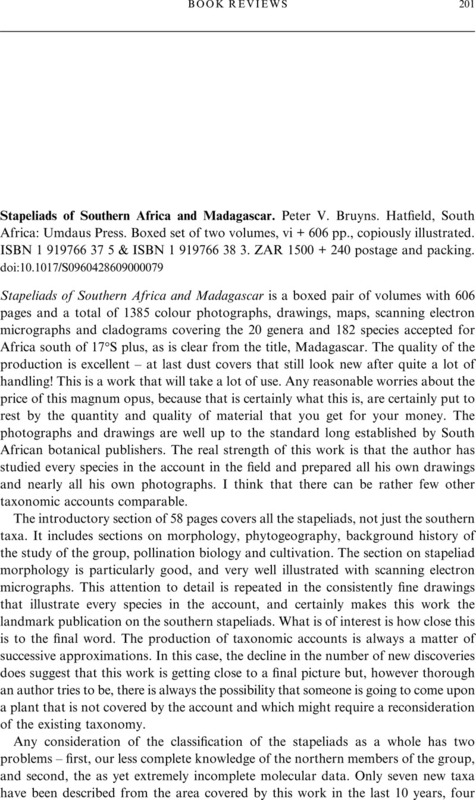 South African Journal of Botany, Vol. 112, Issue. , p. 399. Bruyns, P.V. Klak, C. and Hanáček, P. 2014. Evolution of the stapeliads (Apocynaceae–Asclepiadoideae) – repeated major radiation across Africa in an Old World group. Molecular Phylogenetics and Evolution, Vol. 77, Issue. , p. 251. Masson, F. (1796). Stapeliæ novæ. London: G. Nicol. Meve, U. & Liede, S. (2002). A molecular phylogeny and generic rearrangement of the stapelioid Ceropegieae (Apocynaceae: Asclepioideae). Pl. Syst. Evol. 234: 171–209. Plowes, D. C. H. (1995). A reclassification of Caralluma R. Br. (Stapelieae: Asclepiadaceae). Haseltonia 3: 49–70. White, A. & Sloane, B. L. (1937). The Stapelieae, 2nd edition. USA: Abbey San Encino Press.